A stylish bathroom can uplift and brighten our spirits in readiness for the day, but if it is drab and lacklustre, it can depress us without us being aware that a start to the day in a dank, dull, bathroom may have an adverse effect on our mood. Well, here is a DIY idea that you’ll probably love, no matter whether you have a tiny or spacious bathroom. With simple chic finishes and accessories, it's easy to make your bathroom spa-like. When we think about spas, the first thought that comes to mind is the room's aroma as we walk in and the softly flickering candles. The calming and soothing scents help you go into a tranquil mode. 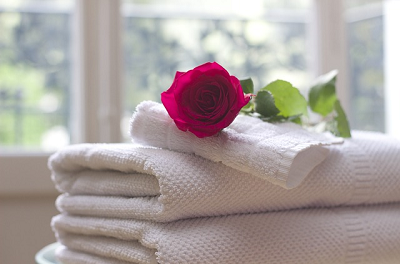 To create a spa-like bathroom, think relaxation with scented candles, beautiful plants, calming scents, bath salts, white robes, aromatherapy, and sets of white fluffy towels. If you think your bathroom lacks style and needs livening up, or you just desire an exotic change, give it the spa treatment that won’t "send you to the cleaners". It will turn out a great makeover even if yours is within a small space and make the room appear like a mini-resort of sorts, right within your home. It’s fairly simple to implement a spa-like bathroom and the items you’ll need to execute this makeover are very easy to find. The ambience you plan to create must be relaxing and soothing not only to your body but also to your mind. Have you ever visited a spa? I’m sure if you have, you’ll find that a visit can be a bit pricey for many of us, that is if we enjoy such treatments a few times each month. If you still wish to be pampered and attended to, you can visit a spa once in a while, but wouldn’t it be nice to treat yourself a few times a week, preferably at night when you are all done with household chores, to a spa treatment? Certainly, you'll love this and it's not so hard to achieve. 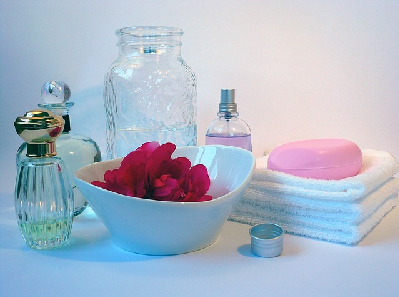 You can turn your bathroom into an exotic spa by simply adding most of these ingredients, props, and of course a splash of ‘drama’ with the wall decal stickers. If you lack enough space for them all, install simple open (or floating shelves) on a free wall space, or in a corner space and layout all your items decoratively. To get a wholesome effect, give yourself a massage with self-massage tools that you can buy cheap, facials with ingredients from your pretty jar collections, and body exfoliating treatments. These are the kind of treatments you'll get in a commercial spa without the high cost associated with them. Once you’ve finished your bathroom spa pampering, dry yourself with your white towel, oil or moisturise your body with special oils you can buy or mix by yourself, wrap yourself in your white fluffy robe, and put on your slippers. And don’t forget to blow out the scented candles before you leave the bathroom.